ONLY 3 LEFT --- Wolo 320-2T Maxi Sound Electric Horn. 12 volts, 2 terminal connection, bright metal chrome grill and red plastic cover. 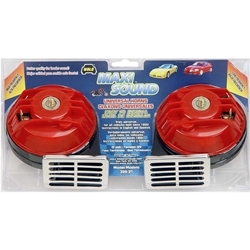 If you are looking for a HIGH POWERED SOUND then MAXI SOUND is the horn for you! Fits all vehicles. Comes complete with all mounting hardware.